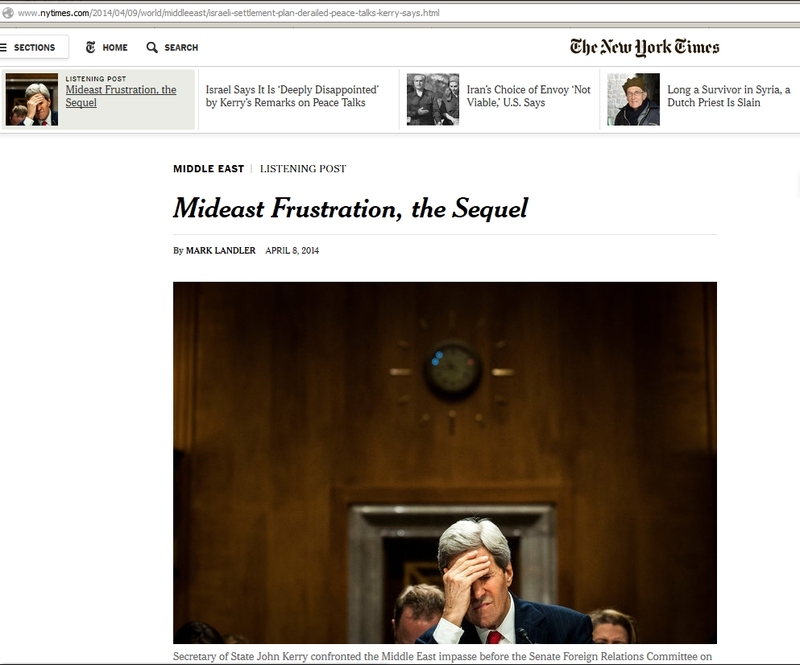 Yesterday we reported that The New York Times was early on the story of John Kerry’s Senate testimony– in which he lay blame for the breakdown in the peace process chiefly on Israel, for missing a prisoner release deadline and then announcing new settlements. The Israelis have complained about Kerry’s remarks. And the State Department has tried to back off from Kerry’s analysis. Mark Landler’s piece had begun with a forthright statement that Kerry blamed Israel’s announcement of 700 settlements in Jerusalem as the cause for the breakdown of the talks. For those who suspect that the Middle East peace process has become a diplomatic drama, playing on an endless loop, Secretary of State John Kerry’s testimony before the Senate Foreign Relations Committee on Tuesday could serve as Exhibit A. The piece also includes a quote from Aaron David Miller lamenting Kerry’s statement as no good for peace. That wasn’t there before. You can see the original story here. This is self-censorship, and disturbing. A lot is at stake here. The talks are about to fail. Blame is the last thing the Israelis want. That would change the paradigm; Palestinians are always to blame. It has been a busy 24 hours at Hasbara Central. Per usual, be sure to scan and analyze the Readers’ Picks among the comments. Much of the time the New York Times (like the Washington Post) appears to be a propaganda arm of the Israeli government and the Israel lobby — and a crude one at that. Among thoughtful readers it invites ridicule more than outrage. Sad. agreed Sean. For quite a while now (since Cast Lead it seems?, can’t pin down a time exactly but it seems it all went dramatically downhill for Israel since then) the readers’ comments online at the NYT have been overwhelmingly pro-justice for Palestinians, consistently calling out Israel’s erroneous ways. The editors are certainly aware, but they are part of the life-support system for Israel so they keep on providing CPR. The body’s stiff at this point, DOA. It’s interesting to speculate as to WHO at the NY Times got the call (or email) and as to WHO, ultimately, made the decision to revise the original reporting. It’s interesting to see headlines change. Was an electronic copy made of the original headline? NYT: “Ohhhh, excuse me, I misspoke! Really!” Well, they are in good company. Christie misspoke when talking in the imperial presence — of the current Dearth Vader, also known as Shelly Adelson. In the past few months, the passive-agressiveness between Israel and America has been astounding. America should have ditched Israel as a favoured nation a long time. Even on purely realist grounds, it has long since outlasted its usefulness. And the notion that Israel is a “light unto the nations”, nobody but the most delusional believes that anymore, even among Zionists. By the way, this is just something that is a guess, but do you guys think Israel’s almost-intentional blowing up of the peace talks had anything to do with the fact that Iran and the Western powers(plus Russia & China) are about to meet in Vienna this coming week? They are pushing for a much more comprehensive deal. Netanyahu has long wanted to focus on the Iranian issue and blowing up the talks would not only allow him to do that, it would also prevent him from getting too serious in the talks. I’m sure he’ll try to bring them up again in a year or two. Just endless talking. But in his mind, Iran is where he wants the focus to be, and a simmering “peace deal”(even if never serious) would zap energy from the issue he wants the world to care about, plus it allows him to fearmonger uninhibited. yes, indeed. No only that. Israel is nothing else but an enormous liability for the USA. Its a drag for the USA’s reputation, howsoever critical this may be anyway, dragging the USA into further global isolation. Beyond this , the special I-US alliance and special relationship is very, very costly in money terms. At the cost of US-citizen, especially the less fortunate ones. One wonders how long the US electorate continues to vote for representatives maintaining this costly relation. For what???? @ Kathleen :-) No one is perfect. Trying to make sweet smelling bread out of Red Heifer sh*t, is doomed to fail. But they don’t care, it’s not in a propagandists brief. As long as the propaganda is out there and propagated. They couldn’t change the address without taking down the page altogether or redirecting it. They are in the habit of shutting down the News and the peace process. The Nakba is decades old history and yet the lamestream hardly notices it. How are you to expect that they will report it if during the course of a conflict, the pals get deported a second time like in the Nakba? A growing minority of Israelis (30%) support this “solution” to their demographic “problem”. This is why I laugh at those who criticize dates like Russia for having state controlled news papers. It’s also funny how on one hand the NYT is trying to spin this as Kerry blaming both sides, yet Aaron David Miller is criticizing Kerry for making statements harmful to the peace process. Why would criticizing both sides be harmful? From my perspective, it is harmful because it perpetuates the fiction that the current situation, including the dispossession and oppression of Palestinians, is not imposed by Israel and the USA. By which, I mean that any valid criticism of the Palestinians is insignificant compared with valid criticism of Israel and the USA. But that’s just my perspective. Among U.S. politicians, of course, the perspective is different. I recall one of the top female federal officials from California telling her audience something to the effect, “we don’t want an even-handed policy, we want to support Israel.” I don’t recall whether it was Pelosi or one of the senators, but on this issue it hardly matters: they blur together. That may be true due to their sincere Zionist-racist beliefs, or simply because is that they know what happens to politicians in the U.S. who dare to call for an “even handed” I/P policy. It may sound reasonable to most Americans, but that does not matter. The abbreviation “pals” for “Palestinians” is used as a term of scorn by many who see the Palestinian people as a hindrance to their goal of achieving a Greater Israel, largely, if not totally, devoid of Palestinians. While I know this particular use was not intended as anything other than abbreviation, I’ve seen it so misused as a term of scorn that I believe it is no more appropriate than the term “hebe” is as an abbreviation for “Hebrew”, or “Izzi” would be for “Israeli”. The Palestinian people have been deprived of almost all symbols of dignity, such as nationhood, so can’t we at least take the time to honor their complete name? This may seem like a petty complaint, but words do matter. I’m curious as to how Aaron David Miller squares his “belief” that the Israel Lobby is a chimera or paper tiger, with his buttressing of it in this article. Shouldn’t this be an perfect opportunity for him to advance his own theory? If so, wouldn’t he take embrace the moment to poke gaping holes in the very flimsy Israeli narrative? Instead he seems to reinforce the flimsy narrative. More BS on display from people that sound soooo reasonable in a meandering philosophical sort of way, but when it comes right down to it, are anything but reasonable. Downright SOS/group-thinkists. The Lobby doesn’t have a veto because non-Jews are a big part of our political thinking [it’s up to them…]… But then he goes on to say that “until” non-Jews ante up in numbers the Israel/Jewish Lobby will hold sway. He is a two-stater, so that explains his NYT quote, but it doesn’t explain why he declines to give “non-Jews” the political information/ammunition, in this circumstance, to make the/a/any break from the Israel lobby, again, given his “belief” that US political supplication to the status quo is anything other than a prescription for a NOT two-state outcome. He continues to have the opportunity and ability to provide distinguishing information, to enable a political result that he desires, yet doesn’t. Yeah well, get the I-people out of the US media so more non Jews know what is going on and they will ante up. Miller is a bought zio tool. @American- I take heart that Miller’s “reasonableness” is now noticeably self-contradictory. It’s not obviously/laughably self-contradictory yet, but it’s coming. As you imply, the pseudo-reasonable backfill needs more exposure and context. That’s coming too. Slowly. Irrefutable and aspirational. The “arc of the moral universe,” one grain of morality at a time. thanks for pointing out ..gotta love Avigail….she’s so damn smart and has a conscience…and guts. Also cut out was a quote from Tzipi Livni to the effect that the 700 new settlement units was approved by Israel’s anti-two state housing minister for the express purpose of tanking the talks. MY COMMENT: I’m certain that AIPAC, ADL and CAMERA (the Committee for Accuracy in Middle East Reporting) all have the Times on “speed dial”. Today, however, such national Jewish organizations as the Anti-Defamation League of B’nai B’rith (ADL) and the American Israel Public Affairs Committee (AIPAC) are using the same tactics to stifle open debate of U.S.
policy in the Middle East. Thanks for this. Over the past 15 years I’ve become aware of how much propaganda we are exposed to from sources I used to regard as reliable and objective. The Internet is mostly responsible for that belated education, and this site certainly plays a key part. The reason the headline was changed is that I filed a completely new, analytical take on the Senate hearing that compared Kerry’s testimony to a similar hearing with James Baker in 1990. In no way was there an effort to censor the story. The headline on the news story was on the Web for 8 hours, and the story set the tone for the media coverage of this issue for the week (see the Israeli government’s angry reaction to Kerry’s comments). In this era of digital journalism, we almost always file an initial news story, followed by a more analytical story, which runs in the next day’s paper, and the headline is always different to distinguish them.